In addition to chewing chicle latex, ancient peoples undoubtedly used it for many practical purposes such as adhesives or sealants. Although chroniclers often failed to document these uses, we can find examples of how similar kinds of natural materials were used in other ways around the world. 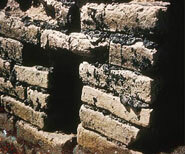 For example, we know that in addition to chicle latex, the Aztecs chewed bitumen, or chapapote, an aromatic and flaky black natural petroleum tar that washed up onto the beaches of the Gulf Coast of Mexico, an area of major oil drilling today. In different parts of the world, bitumen and other naturally sticky substances have been used as adhesives and sealants. For example, the ancient Sumerians used it to waterproof their ships, as a kind of glue to stick pieces together on their carvings, or even as a kind of mortar between the bricks used in their buildings. Ancient Europeans, like Ötzi the Ice Man, a 5,300-year-old ice mummy found in the Italian Alps, also heated birch wood to force the tar to seep out and used it to haft his copper axe on a wooden handle. We also know that the artisans among the Coclé people of Panama filled large gold ear rods with chicle latex. The gum served to hold separate pieces of goldwork together, as well as reinforced the thin sheets of gold from which the rods were made. Ancient Maya artisans used a thin layer of copal incense, which is a resin that was often mixed with chicle and burned, to adhere cinnabar to greenstone objects. The also used it as a binder for the paint pigments in the famous murals at the site of Bonampak in Chiapas. your wife can live as long as the coming flood will last.” They obeyed the spirit, and after the great flood they emerged from their chewing gum ark to find that they were the only survivors on earth. NOTE: Professor Mathews has kindly supplied academic references in support of the points mentioned in her article. If you would like details of these, please contact Mexicolore. Interesting article - did the Aztecs ever make use of any other petroleum products?